You are playing in a multiple deck game, where you're allowed to double down on any two cards. You're dealt a six and a deuce for a two-card total of eight and the dealer turns up a five. What play do you make? The correct play is to just hit the hand. Here's the explanation, with the admission that it's understandable if you're tempted to double here. The dealer is holding a five, and you're well aware that he will bust 42% of the time with that upcard. Furthermore, he will get to 19 or higher on only 31% of his hands. So, doubling down and drawing a ten-value card would put you in good stead, right? Well, yes, but obviously your chances of drawing a card to make you "pat" are, at this point, 24 of 49 (49%) at best. This figure is derived by taking the theoretical number of nines, ten-value cards, and aces in a deck compared to the total number left (remember, your two cards and dealer's hole card take three cards out of the mix). 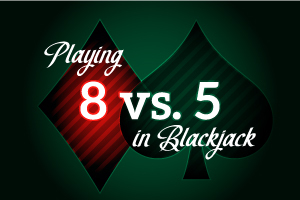 This means when you take one hit in a double-down situation, you have less than a 50% chance to get to 17 or higher, while the dealer will get there 58% of the time. Indeed, you'll win 1% more than you lose if you double, while the hitting option brings you EIGHT more wins than losses per hundred hands. Hitting brings you four times the gain as doubling.